Walden Pond Press, 9780061944925, 368pp. It's only been a month since Gerald Wilkins became the richest kid on earth and uncovered a plot of murder and deception stretching back hundreds of years. But the events of The Billionaire's Curse were just the beginning. 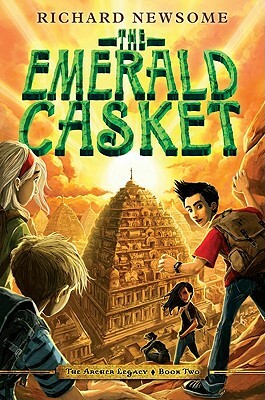 As book two opens, Gerald, Sam, and Ruby discover that Gerald's family has been protecting a secret concerning nothing less than the fate of the world. Now the three are off to India in a desperate attempt to uncover the truth before their enemies do. It's entirely possible this month may be even more eventful than the last. Richard Newsome is the author of the first two books in the Archer Legacy, The Billionaire's Curse and The Emerald Casket. In researching the trilogy, Richard traveled to England, India, France, Italy, and Greece, visiting many of the historical sites featured in the books. He lives with his family in Brisbane, Australia.